A Quilting Sheep: Taking forever!! Last week, I began quilting my Favorite Things quilt I made from the Craftsy class Twisted Irish Chain. This quilt seems like it taking forever to get the quilting finished. Partly because I am quilting this one densely so its very slow going and partly because I have been working extra hours at the shop to do inventory. Let me just say, I am so glad that it only happens once a year! I have finished quilting two of the rows and have five more to go. Here is a close up of the dense wavy lines. I want the lines to cross and touch occasionally. Just love your backing! 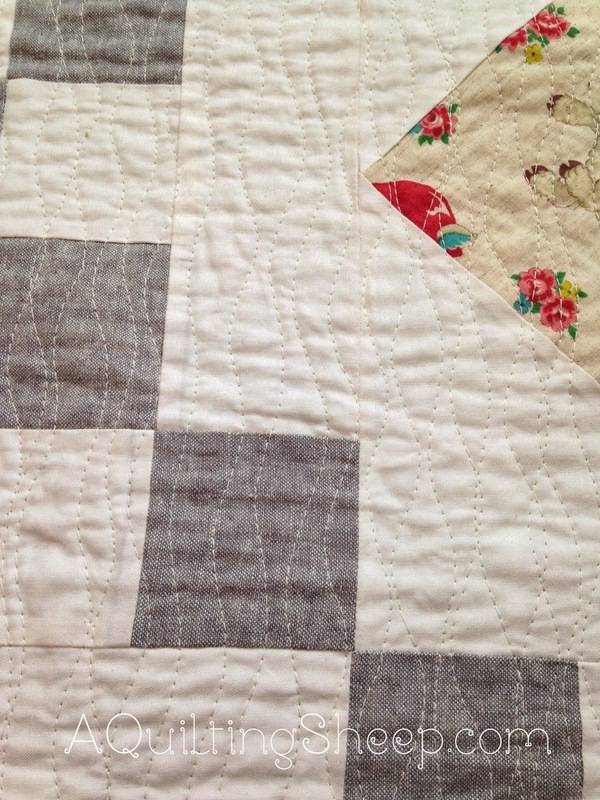 Your wonderful quilting really adds the right touch to the whole quilt. I love that quilting, I'll have to try it on my next quilt. That backing is perfect for you! You are so talented and I'm so jealous!! I started a Christmas quilt and only have about 12 inches left to quilt and then bind it and I haven't yet! I'm so ashamed! Maybe it'll be ready for next Christmas. I love yours and your quilting is lovely!! 😍 love the quilt! I need to get busy everybody is posting all the finishes they have. The holidays for me and quilting is not possible. Maybe now that everything is over I can get back to it. this looks amazing...did you quilt this on a home machine or a long arm? Your quilting looks great! I love this pattern. I did this class as well and am planning to make the Granny Squares quilt this year. I love your quilting. And the quilt back - these sheeps are sooo cute! Great job. I love the quilting. It may be taking forever, but it looks absolutely a.ma.zing!! The time spent quilting is paying off! 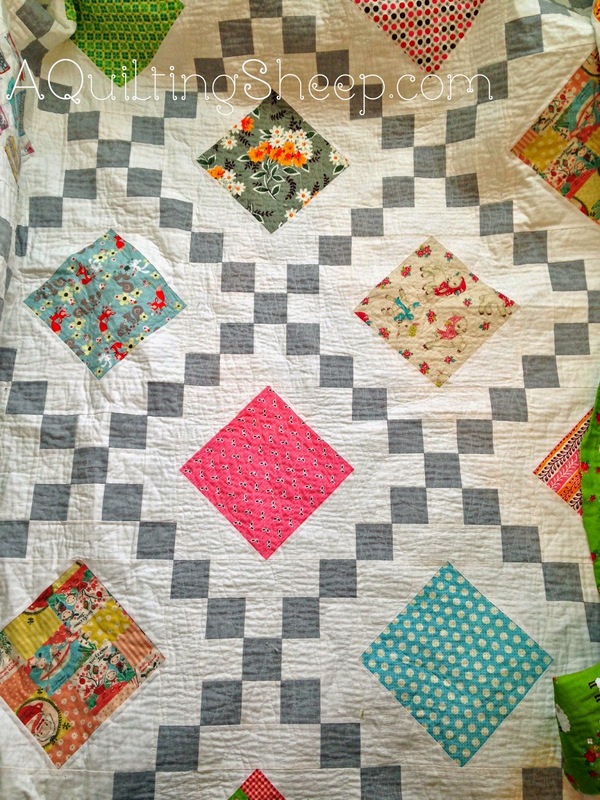 Love that wavy line quilting! Are you using your walking foot or free motion? Oh that turned out gorgeous. 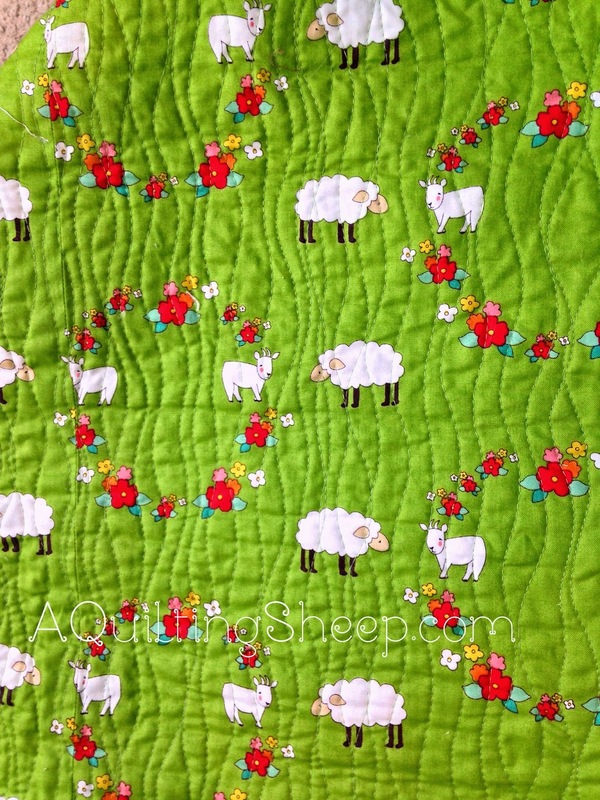 Love the dense quilting and the fabric with sheep on a field of bright happy green with a ring of flowers is precious. Your quilting is beautiful. I really love that backing fabric. Is it still available? I love the quilt and quilting. It's looking great.